Spring has brought a blend of great progress and heartbreaking setbacks. Not only has the weather been some of the worst on record, the process of moving a farm is exponentially difficult. Going into 2018, I knew that this year will likely be the toughest I've lived thus far, so back in January I taped the word TENACITY onto my desk and repeat it as a mantra. Tenacity is defined as "the quality or fact of being very determined; determination; the quality or fact of continuing to exist; persistence." Persistence, determination and tenacity - combined with proper planning and intentionality - are the only way to keep making forward progress. 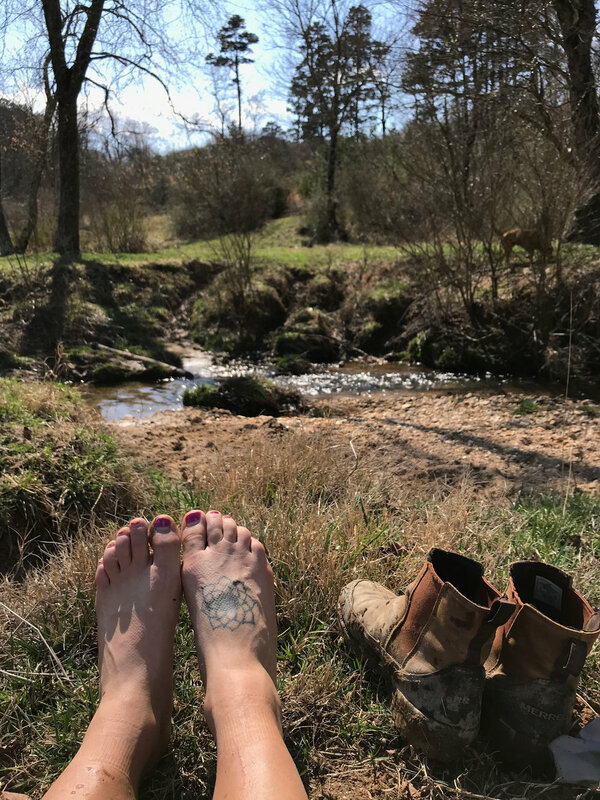 Being your own cheerleader and taking inspiration in even the smallest places is survival 101 for an entrepreneur and especially for a farmer. So even though progress is slow at the new farm, progress is indeed being made. Knowing that we wanted to begin planing at the new farm early in 2018, with a goal of fully moving the farming operation by mid-summer, the preparations began long before breaking ground. 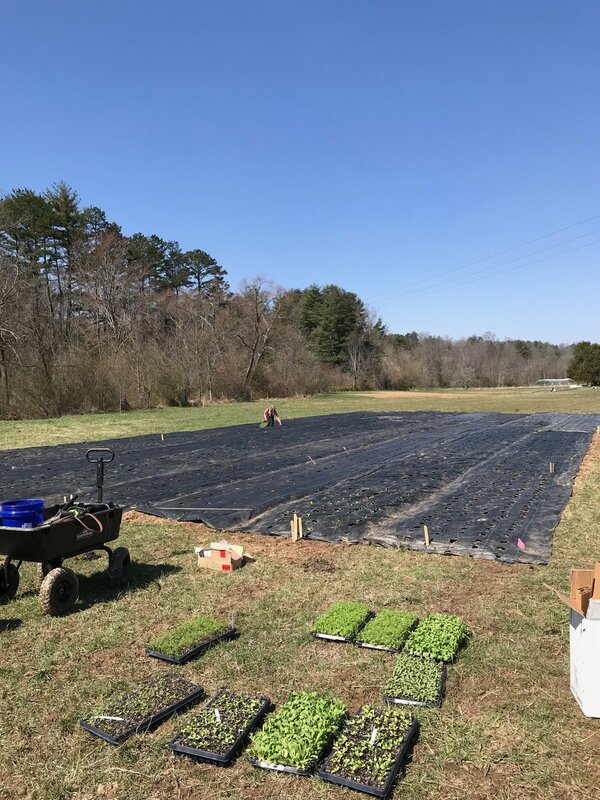 We planted all of our fall crops like ranunculus, tulips, anemone and cool flowers like snapdragons, bupleurum and foxglove at the old farm in Candler where we've been farming for the past several years. I initially hoped to fall plant (2017) at the new farm, but accepted the fact that this would mean rushing through soil prep and rushing typically leads to mistakes or poor overall quality. So I made the decision to fall plant at the old farm and to begin planting on our new land for the 2018 calendar year. Last July I had a soil test completed through the NC Extension Office and discovered that the soil had a slightly low pH (very standard for Western North Carolina). After mapping out the field locations, which entailed lots of measuring and remeasuring, I slowly begin breaking ground with our new tractor. After finally accomplishing a loamy tilled field, I applied the recommend amount of lime to balance the pH levels as well as some organic fertilizer (also applied based on recommendations from the soil report). I incorporated this into the soil and then sowed a cover crop mixture of oats, winter peas and rye. 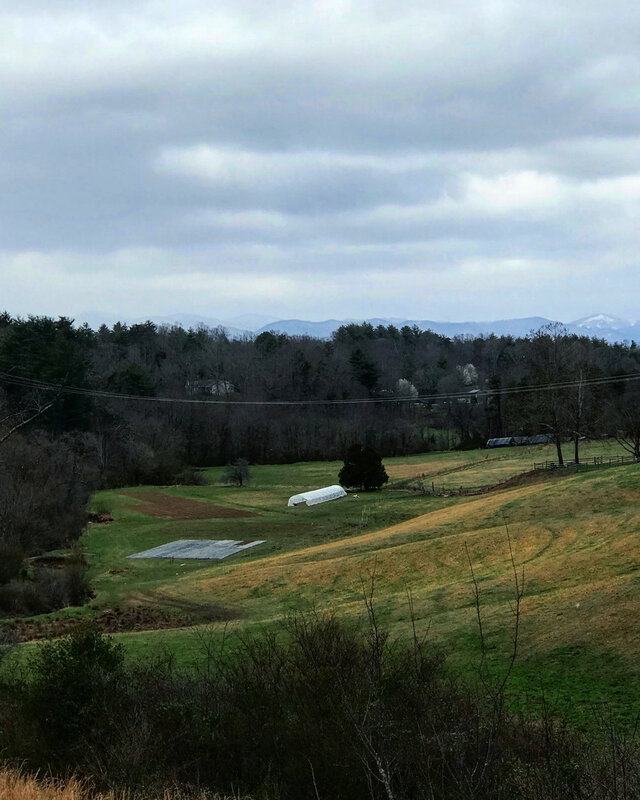 While ideally all of our fields would be the same dimensions, that is just not practical for the shape of our farm - I'm trying to maximize every foot of flat ground so we have 4 fields of different sizes. Once the soil warmed and dried out enough, I tilled under the cover crop and the fields were ready to go for spring planting. We laid landscape fabric and began tucking plants into the ground. We do not direct sow any seeds because of the high weed/grass pressure. Typically lay drip tape for irrigation under the landscape fabric, however this year we will lay it on top of the fabric once it becomes necessary to irrigate. We've had more than enough rain so far and do not have a well on the property yet (or a road for that matter), so that was something that I have chosen to figure out only when it becomes necessary. We can irrigate out of the creek that borders the fields if/when things dry out. We also built a new hoop house for crop protection and season extension. 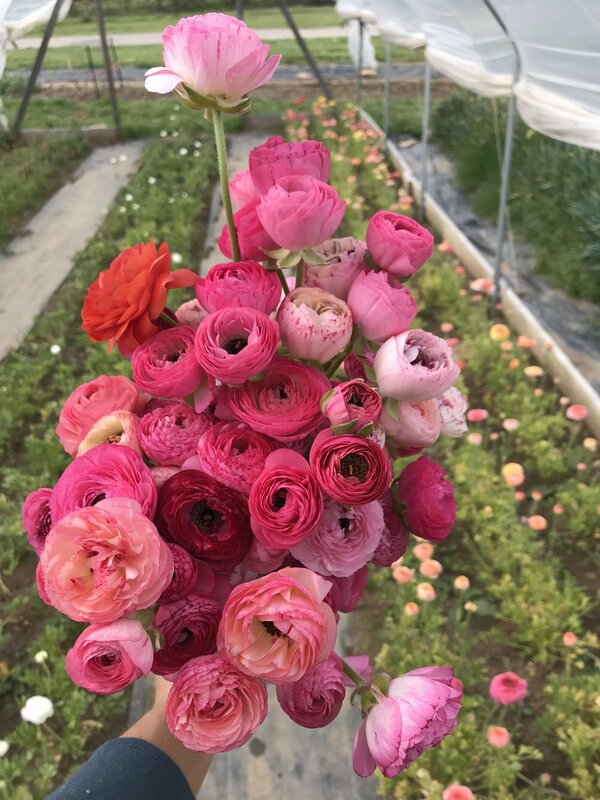 We have 3 of the same hoop houses at the old farm, but they are currently filled with ranunculus and the timing was going to be too tight for moving the old houses to the new farm. Knowing that we needed to plant the lisianthus and a couple of other crops in a hoop house before the ranunculus would be finished blooming, I decided to bite the bullet and buy a new hoop house for the new farm. We plan to move the older hoop houses from the old farm to the new farm at some point over the summer, but the extra expense of the new hoop house is so worth not having to rush the move. Plus we have enough space for all of them at the new farm and covered growing space is worth its weight in gold to a flower farmer. A true low point for me this spring was when the new hoop house was destroyed by wind less than one week after we finished building it. These are the circumstances that are completely out of our control as farmers, but are truly devastating. So after shedding tears and feeling quite down for a couple of days, I did lots of research and ordered the necessary supplies to rebuild and reinforce. The whole east coast has been experiencing intensely unusual wind this spring, so this hopefully doesn't happen again, but it could be a new normal. We've had gusts of 40-50mph winds lately and it seems to be holding strong! Being able to finally invest in perennials feels like a dream come true! I've kept a notebook full of plants names that I add to consistently over the years and this wish list is finally becoming reality. I'm slowing tracking down the perennial plants and attempting to prioritize since I could easily spend thousands and thousands of dollars. So I set a budget for this first year and have mostly adhered to it. 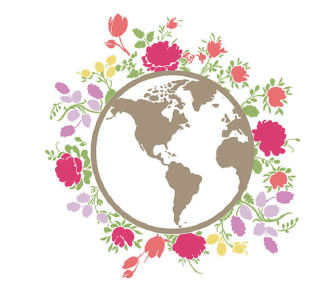 A top priority was investing in peonies since they take several years to get established, but are also a great return on investment. So this fall we'll plant our first 300 peony roots. Another priority is foliage and flowering branches so I ordered about 300 bare root trees and shrubs from Lawyer Nursery in Montana. Ordering bare roots means that they'll take longer to become well established and harvest-able, but they are also more affordable on the scale that we need. While all of this exciting yet challenging progress is being made at the new farm, we're still hosting workshops and harvesting gorgeous flowers from the old farm. Balancing all of the work at different locations is deeply exhausting, but tenacity keeps me moving forward. Plus, I have an incredible Assistant Farm Manager. So despite all the many challenges and setbacks, I'm so excited about our new farm and the path that we are journeying on! Its truly a dream come true to be farming on our own piece of dirt and to be working towards all of the other exciting facets that we're incorporating on the property. More on those facets later! I'd love to hear what projects, large or small, that you're working on and what keeps you moving forward during those challenging moments.